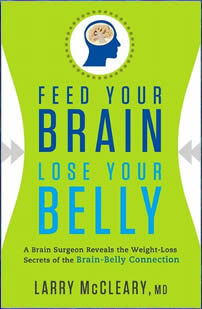 Feed Your Brain, Lose Your Belly, is written by neurosurgeon Dr. Larry McCleary and is based on the concept that the calories people are consuming are bypassing their brains and being stored in fat cells. He explains how “sticky” fat cells confuse the brain by sending it distorted messages, which in turn results in cravings, increased appetite, overeating and obesity. He claims that weight loss becomes easy on this plan because you are working in harmony with your body’s innate metabolic machinery by eating a diet that naturally supports a healthy appetite and balanced brain function. In this book McCleary reveals the secret to staying slim and mentally alert by selecting foods that nourish your brain and keep your waistline trim. Feed Your Brain, Lose Your Belly is based on controlling blood glucose levels by eating a diet containing low glycemic carbohydrates, healthy fats, and lean protein. This has the effect of rejuvenating aging and injured brains while helping to control appetite and support weight loss at the same time. The primary concept of the diet involves eating healthy fats and low-glycemic carbohydrates in a ratio greater than 2 to 1. The macronutrient breakdown of the diet is 20 percent protein, 15 to 25 percent carbohydrates and 55 to 65 percent fat. Dr. McCleary discusses why some people can eat very little and still have a hard time losing weight. He also talks about why other diets are not very effective including the calorie-restricted low-fat diet, the calorie-restricted higher-fat diet, the total starvation diet, the cruise ship diet and the typical American diet. Also provided in Feed Your Brain, Lose Your Belly Fat is a seven-day meal plan with recipes, along with a comprehensive list of foods that are to be avoided and included on the program. Fruit, vegetables, legumes, salmon, trout, sardines, tuna, mackerel, lean beef, chicken, turkey, buffalo, venison, ostrich, lamb, pork, cheese, plain yogurt, nuts, seeds, avocado, olives, olive oil, canola oil, coconut oil, flaxseed oil, butter, margarine (trans-fat free), herbs and spices, dark chocolate, green tea, red wine. Moderate exercise is encouraged so that all participants in the program will feel safe regardless of their fitness level and will have a stable foundation to build upon. You will walk for 30 to 50 minutes, three times a week, perform resistance exercises twice a week for 20 to 30 minutes and do 10 minutes of balance and agility exercises a few times a week. Feed Your Brain, Lose Your Belly, retails at $23.95. Encourages a high intake of fruit, vegetables, and low glycemic carbohydrates. Explains the benefits of healthy fats. Author is a neurosurgeon who understands how the brain works. Acknowledges the importance of the mind-body connection for successful weight loss. Diet is high in fat, including saturated fats, which have been associated with an increased risk for cardiovascular disease and diabetes. Fairly restrictive and may require dieters to give up some of their favorite foods, such as bread, pasta, potatoes, and desserts. Recommends the use of expensive nutritional supplements to achieve the best results. Feed Your Brain, Lose Your Belly is based on the concept that a high intake of “healthy fats” will support optimal brain function and regulate the appetite so as to promote weight loss. This way of eating has been demonstrated in a six-week clinical research trial to produce beneficial results, however, the long-term safety and effectiveness of the diet has not been adequately evaluated. Additionally this diet is very high in fat, including saturated fats, which may increase the risk of developing diabetes and cardiovascular disease.